If you are in New York City and craving a little slice of New Orleans, the Great Jones Cafe has just about everything you need. You’ll forget that you are still in New York City from the moment you step into this small cafe, which is likely around the same size as your living room at home. Unlike your living room; however, the Great Jones Cafe features one of the coolest jukeboxes in the world – so cool that it has become a twenty year old New York legend. At busy times you may have to reserve a table, go for a look around some of the fantastic nearby stores and head back when your table is ready, but this little unassuming roadside-style hideaway is a must visit when you are in NYC. We’ve eaten here many times prior to this review and sampled some of their southern classics such as eggs jambalaya and their blackened crayfish po boy; however, on this return visit it was the burgers that we were after. The menu at Great Jones is handwritten on the wall and as I scanned the burgers on offer, I was undecided between the bacon cheeseburger and the chilli burger. Thinking that I’d get a better idea of the patty itself with the bacon cheeseburger, I placed my order, ordered a beer and enjoyed some fantastic music from that amazing jukebox. Speaking of beer, they have a very impressive selection of draught beer and cocktails. They also offer half price pints between 5-7pm during the week and a dollar off cocktails! The burger itself certainly looks the part. It’s big, messy and served with one of the biggest portions of sweet potato fries you are ever likely to see. I asked for the patty to be cooked medium and while I felt it was slightly more well done, it was still deliciously juicy. 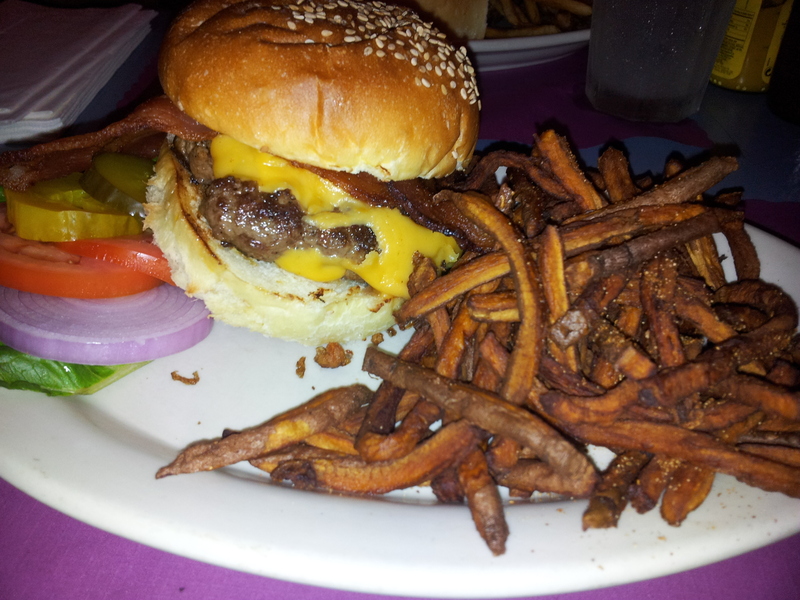 As I cut into the burger, the juices from the patty ran out on to the plate and soaked most of my sweet potato fries. 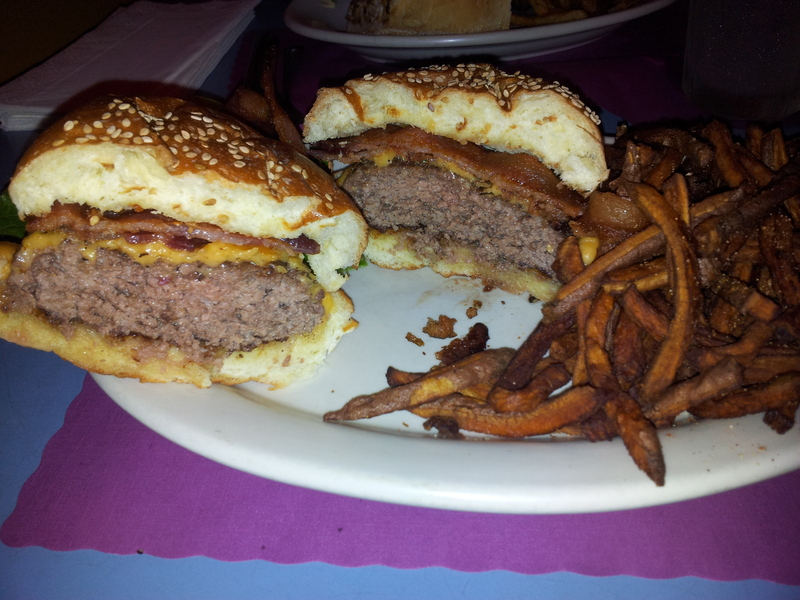 The patty had a slight kick to it and tasted like it had been seasoned with whole grain mustard. It produced a nice intense beef flavour, which married well with the spice from the seasoning. The patty itself was huge and for a lunch portion, it was a little daunting especially combined with the trough of sweet potato fries that it came with. The American cheese practically dissolved in the juices from the patty and gave the burger a nice moist, melt in the mouth texture. My only real complaints were that the bacon was a little hard and I actually managed to hurt my tooth at a point from taking a bite. I just took the rest off and it was actually much better without it. The bun was fine, if a little unspectacular. It held everything together well and absorbed a lot of the juices from the patty; however, there wasn’t much taste from it and just felt like a standard bun. There was nothing bad about the bun as such – it just wasn’t anything to shout about. If you hadn’t already guessed, we’re huge fans of sweet potato fries and the Great Jones Cafe does some of the best in New York City. They were so good, I even stole a few from Pamela’s plate once I had finished mine! Overall, the Great Jones Cafe offers up an otherwise fantastic burger, only let down by a disappointing bun and bacon that was a little tough. I’d recommend avoiding the bacon and just going for a regular cheeseburger as the bun is easy to overlook when you consider how tasty the patty is. Despite mine being cooked a little more than medium, I absolutely loved what was sent out. At just under $11, it’s good value for money too. 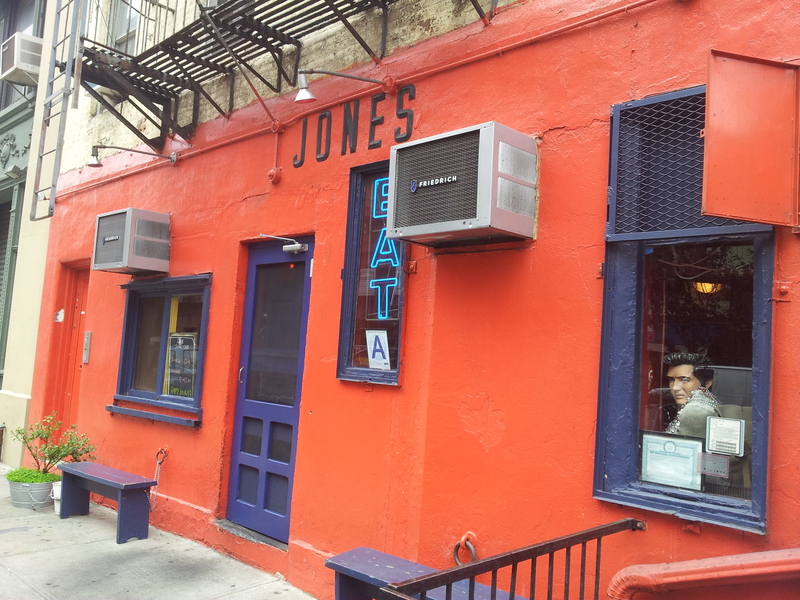 If you are lucky enough to get a table, get yourself along to the Great Jones Cafe the next time you are in New York City for a laid back atmosphere, one of the best jukeboxes in the world, hard cocktails and a real taste of the south. Heya! I’ve never had sweet potato fries but you apparently have, are they usually this dark? Ah good because I thought they looked a bit burned. Glad to know that wasn’t the case.